In Shirley Jackson’s short story “The Lottery” the townspeople of an unnamed village participate in a paper lottery that ultimately has a sinister purpose: to decide who is to die by stoning. Perhaps most disturbing is the fact that all the characters seem so relaxed before the stoning begins – children play in the dirt, men huddle around joking, women gossip amongst themselves. Indeed, the normalcy evidenced by the characters in the face of such an impending horrific event seems ridiculous – how could people let such a terrible thing happen and act as if it’s only a social gathering? Jackson’s implied answer shines through the numerous moments in the story in which the characters hint at the deep tradition of the event and the power that this tradition holds for them and their town. It is this tradition that overcomes their ethical sense and makes the story such a powerful homily on the dangers of an uncritical acceptance of social mores. Such poetic criticism, with its nod to Shirley Jackson, is at the kernel of Haines’ exquisite first solo record. 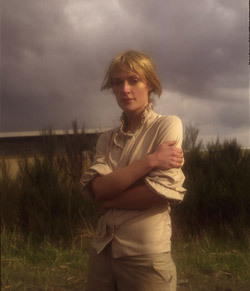 Better known as the front woman for Canadian pop politicians Metric as well as the voice behind Broken Social Scene’s modern classic “Anthems of a Seventeen Year Old Girl”, Haines recorded the mellow, piano-based ballads of Knives Don’t Have Your Back over the course of four years in six different studios. Enlisting a veritable “Who’s Who Among Canadian Indie Outfits” to flesh out the songs, a group she calls the Soft Skeleton, Haines allowed her minimalistic compositions to take on a layered complexity. Sparklehorse drummer Scott Minor, Broken Social Scene’s Justin Peroff, Metric’s Jimmy Shaw, Stars member Evan Cranley, and the Tokai String Quartet are among the honor roll that helped develop Knives’ autumnal textures. Haines’ late father, jazz musician Paul Haines, gets a nod as well with the album’s spartan cover art, its simple text and colors reminiscent of his 1971 release Escalator Over The Hill. Opener “Our Hell” begins with menacing ivories, adding drums and backing vocals as Haines opines that “What I thought it was/it isn’t now.” First single “Doctor Blind” has an ethereal quality recalling a drug-induced haze with jazzy drums, thick synths, and epic strings, a sound which fits in perfectly with its critique of our pharmaceutical prescription-based society. The emptiness in “Crowd Surf Off a Cliff” is devastating, building on a simple chord progression until you find yourself pleading with Haines: “If you find me, hide me, I don’t know where I’ve been.” Both “Reading In Bed” and “The Last Page” evoke the power of the written word in relationships, with the former commenting “all of your lives unled/reading in bed.” The feminist critique of “The Lottery” continues in “Detective Daughter” and “The Maid Needs A Maid”. In the latter, a play on Neil Young’s Harvest Moon ballad “A Man Needs A Maid”, a striking critique of frat boy mentality evolves. Just with her single piano in the background, and a repeated refrain of “Bros before hos/read the guidelines,” Haines portrays the traditional wishes of the red-state North American male: “Will you put on the fire for me/draw the bath and remind me to eat?” Horns and willowy background vocals give an unsettling quality to “Mostly Waving”, and in closer “Winning” Haines’ adage that “all our songs will be lullabyes in no time” is self-fulfilling with its calming melody. As striking as Cat Powers’ Covers Record, as moving as Iron & Wine’s Endless Numbered Days, and as scathing in its criticisms as a David Bazan record, Haines’ Knives is a modern contemplative classic. If piano is the new black, Emily Haines is as chic as they come. But, it seems, she isn’t about to let that popularity kill her drive to be a progressive voice in music and accept the status quo. There is no doubt, though, that if she did regress, a brief revisit to Shirley Jackson’s “The Lottery” would right her sense of direction.